An upright shrub with lustrous, dark green leaves, that turn burgundy red in the fall. 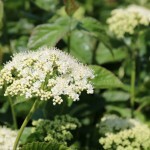 The spring flowers are creamy white, fruit is dark blue. It grows best in full sun to part shade in most well-drained soils. 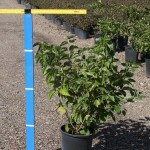 Use for a hedge or screen, as an accent in the shrub border, or in mass planting. Selected by Synnestved Nursery of Illinois for its uniform oval-rounded habit.